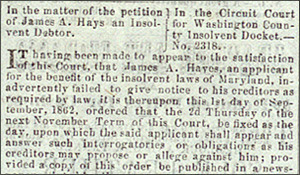 In the matter of the petition of James A. Hays, an Insolvent Debtor. In the Circuit Court for Washington County Insolvent Docket - No. 2318. IT having been made to appear to the satisfaction of this Court, that James A. Hayes, an applicant for the benefit of the insolvent laws in Maryland, inadvertently failed to give notice to his creditors as required by law, it is thereupon, this 1st day of September, 1862, ordered that the 2d Thursday of the next November Term of this Court, be fixed as the day, upon which the said applicant shall appear and answer such interrogatories or obligations as his creditors may propose or allege against him; provided a copy of this order be published in a newspaper printed in Hagerstown once a week for three months successively before the said 2d Thursday of the next November Term of said Court. Sept. 3. ISAAC NESBITT, Clerk.